Why Not Free EMR Software? You may have noticed I said “affordable” and not “free” electronic medical records. There’s a good reason for that. Like free practice management software, free electronic medical records software has significant drawbacks. Free EMR systems tend to be much more limited than their paid counterparts — there are usually little to no customization options, and you’re likely to hit a limit on the number of patients you can store in the system. Another issue is that with electronic medical records software, “free” is often a technicality. In the age of freemium games and entertainment, you’re probably familiar with applications that start off free only to rope you into paying once you’ve become invested in it. Lots of these medical record freeware programs come with hidden costs in the form of upgrades and gated content that you’ll find is not optional at all. And finally, there just isn’t a large selection of free EMR programs. Because the technology is so important — lives literally depend on it, after all — very few people are comfortable with truly free, open source EMR. Beyond the liability reasons, there just aren’t many developers creating open-source EMRs. So while you can definitely find EMR free, we don’t recommend it. Part of Kareo’s extensive suite of medical software, Kareo Clinical EHR is a powerful solution for medical charting. Its HTML5 programming and open API means it has excellent interoperability with other medical software platforms, a feature sorely lacking in more expensive products like Epiccare. Plus, it integrates seamlessly with Kareo Practice Management, Kareo’s all-in-one solution for billing, charting and scheduling. This cloud-based platform is ideal for solo to mid-sized practices looking for an intuitive, easy-to-use system. It functions well on both desktop and mobile sites, so users can easily take their care on the go. The ePrescribing feature lets physicians create accurate prescriptions and send them directly to the patient’s pharmacy of choice from any device. Kareo offers robust customizable reporting features. Users can run reports from a template, or build their own to get insights into key performance indicators (KPIs) of their day-to-day operations. Its customizable physician dashboards make navigating the system smooth and intuitive, as well as keeps the number of clicks they have to use to get through tasks to a minimum. Kareo provides quick and efficient insurance verification, so you and your patients are always on the same page when it comes to treatment eligibility. Users can get started right away with Kareo — it comes with zero setup fees and a low monthly subscription fee. Users can pick and choose the training videos they need as they go along, as well as return to any videos they need to review. NueMD’s cloud-based medical suite is scalable for businesses of all sizes. It is a combined practice management solution that offers medical billing, patient scheduling and electronic medical record capabilities. It integrates with many other medical software systems, making patient data transferral a breeze. Physicians can choose to only use a sub-product (its EMR for example) or opt in for the whole product. It can also be customized for a variety of different specialties so that you get a system designed for your type of medical practice. Physicians can use NueMD to order tests and store the results directly in the system with the patient’s other data. The charting features of this EHR are customizable to your specific needs. NueMD also offers a patient chart management tool that provides patient health snapshots, medication histories, allergies and clinical summaries. Physicians can create patient SOAP notes and send them directly to other healthcare institutions or insurance providers. 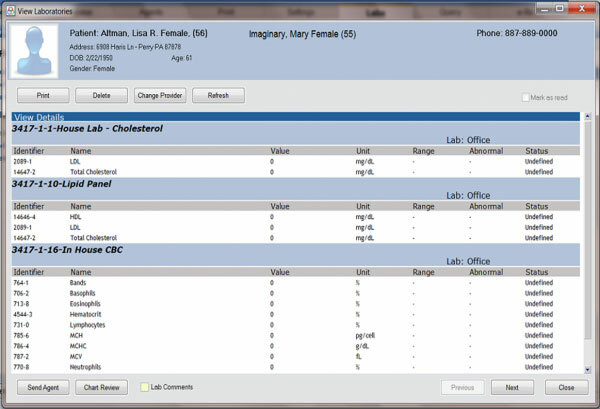 This EMR offers a native lab and pharmacy management database. With this, physicians can monitor medications, refill requests and pharmacy preferences of patients. 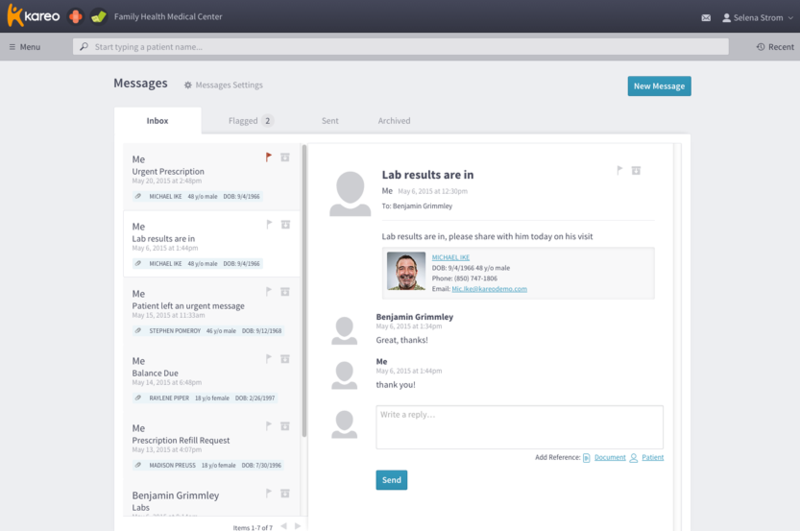 Lab results can be uploaded directly to the system. NueMD’s billing module makes the billing process easy. Its HIPAA-compliant data security streamlines administrative data entry from insurance eligibility checks through to claims payment. This ultra-flexible EMR is great for smaller practices and independent physicians but has the ability to grow with you if you expand. The clean, simple interface of Praxis is a welcome change from many cumbersome EMR UIs, and this system is consistently praised for its intuitiveness and ease of use. Praxis prides itself on its proprietary AI that learns from users previous actions to cater to individual physicians. Instead of relying on pre-built templates, users can chart how they feel comfortable — this drastically decreases the learning curve to get used to the system. It encourages healthcare practitioners to create and customize documents in a way that works for them. That being said, if users want to save templates and frequently-used note formats, they can do so easily! Assessments, encounters, lab results, medications, etc. can be saved in the desired format as “knowledge” and assigned to individual patient profiles. This reduces the number of clicks and the amount of data entry physicians need to undergo at each encounter. This affordable electronic medical records system integrates well with many other medical software systems. Patients can schedule their own appointments and interact with their health record via a patient portal. Praxis’ concept processor offers a capability that makes taking notes even easier through talk-to-text dictation. This cloud-based EHR was designed with doctors’ workflows in mind. The clean interface and ease-of-use are all very appealing features to doctors who don’t want to spend time learning to use a clunky system. The platform is flexible and adaptable: users can add additional modules and add-ons as they go. Desk staff can manage patient appointments within the EMR system, reducing the need to bounce between screens to finish the frequent tasks of scheduling. With Practice Fusion, ePrescribing is a breeze — physicians can send prescriptions directly from patients’ charts, further reducing the need to click to a new screen. Patients can have direct input in their health care via Practice Fusion’s patient portal. This makes the intuitive system easy for doctors and patients alike to use. It is built to meet HIPAA, Meaningful Use and other security standards, so you’ll never have to worry about expensive fines or disastrous data leaks. Users nervous about the learning curve can sign up for Practice Fusion’s free live training sessions. Upon signup, a customer service agent will be paired with practices to guide them through the implementation process. This platform used to be a free online EMR product, but has recently moved to the more typical price structure of a per-user-per-month billing subscription. However, its prices are still quite low in comparison to other systems. Another EMR/Medical Practice Management combo software, Optum’s goal is to help physicians provide value-based care quickly, efficiently and affordably. It focuses on the importance of reporting and analytics to help staff make data-driven decisions. Physicians can rely on accurate quality measurements, advanced clinical documentation capabilities and a streamlined workflow when they implement Optum. This web-based EMR is a scalable, cost-effective solution especially suited to solo or independent practitioners, new practices, and mid-sized joint practices. 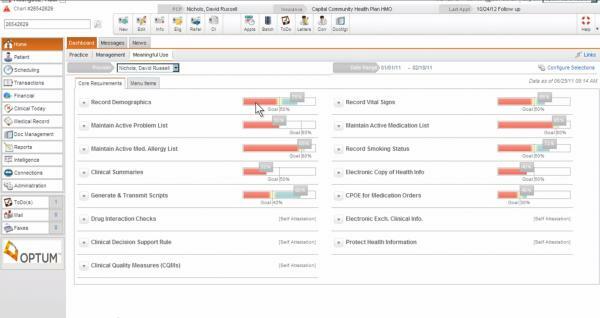 Optum’s meaningful-use physician dashboards let users assess care plans and patient status at a glance. You also have access to a library of related care plans, assessments, best practices and other resources to build insight into individual patients or larger demographic groups. Customizable dashboards and chart summaries reduce the time spent clicking through information. Dashboards and reports can be customized using industry-specific templates. Doctors can use the dictation tool to speak notes directly into the program, and patients can see lab results or other information right away through the secure patient portal. The claims management feature of this EMR pre-screens every claim submitted to scrub it for errors before clerical agents look it over. You’ll never have to resubmit a claim for simple coding errors when you use Optum’s clearinghouse. This electronic medical record software offers charting solutions for practices of all sizes. It has specialty-specific modules for a huge range of practices including behavioral therapy, cardiology, emergency medicine, family care, internal medicine, pediatrics, physical therapy and many more. The core functionality of this affordable EMR offers all the features a healthcare provider could need. Care planning lets physicians, staff and patients alike track and manage long-term care strategies. Patients can access educational resources, request refills through the patient portal or even set up automatic refill requests for their convenience. With color-coded physician dashboards, doctors and staff can easily take in important scheduling and patient information at a glance. They can pass that information on via referrals, and track which specialists or other care providers individual patients are seeing. Additional reports and charts allow users to track key performance indicators (KPIs) to monitor the health of both their practice and their patients. 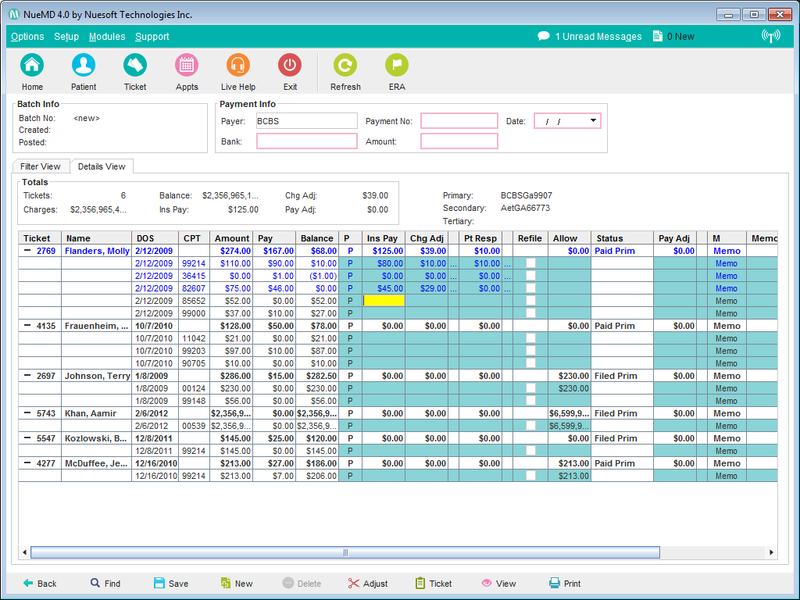 In addition, iSalus can come with practice management features for scheduling and billing. It can be set to send out automatic appointment reminders, which helps reduce the number of no-shows that cost doctors time and money. For the financial side of your business, it offers accounts receivable, electronic claims, audit trails, electronic patient statements, document management, insurance eligibility checks, payments posting and more. This EHR is designed specifically for mental and behavioral health providers, but can be customized to fit the needs of any medical practice. During implementation, they will convert your existing paper medical forms to electronic format so the learning curve is as minimal as possible! This intense customization is key to EHR Your Way’s operation — you don’t have to mess around with templates, just build the forms you already use in the electronic environment and keep doing what you were doing before. If you’re not sold on the digital era of medical records, you can stick to pen and paper. This system offers a unique ability to create barcodes for relevant information that will scan data from paper into the system. This EHR offers practice management features as well — the appointment module sends out automated reminders to both patients and staff to decrease missed appointments. Admins can see master schedules to ensure meetings and appointments are scheduled at times when specific staff are available. Its internal messaging system further consolidates the workflows necessary to medical practice operations. This keeps users from having to bounce between screens to get work done. EHR Your Way prides itself on its smart processes — smart setup rules help prevent users from forgetting key steps in their documentation workflows. Smart forms auto-populate to avoid data entry errors and smart content helps standardize form terminology by auto-filling forms via your customized requirements. These modern approaches to paperwork help streamline your practice’s day-to-day activities and boost your efficiency. There is no single best affordable EMR system — but there is a best EMR for your organization. 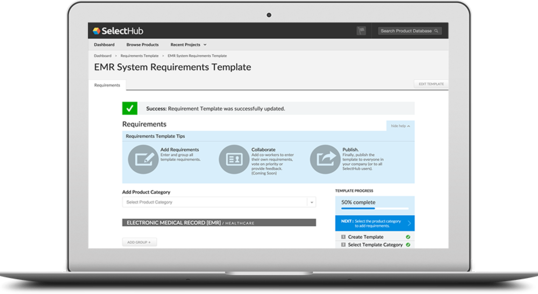 To find out what you need from an EMR, get our EMR/EHR software free requirements template to start gathering your unique specifications. Then take those requirements to our EHR/EMR comparison report to find the best-match platforms for your business. These steps will leave you with an intelligently selected shortlist of vendors that can deliver what you need in an EMR. Do you use a cost-effective EMR that you didn’t see on this list? Tell us about your experience in the comments!